The Anish side tables collection features drawers where the handle, formed by subtraction, functionally lightens the frontal appearance while defining the compartments’ composition. The detail naturally becomes the focus of attention, as an invitation to reveal the contents. Structure made from particleboard, either veneered and stained or melamine-coated and lacquered. The thickness of the structure and shelves is 18 mm, the back panel 10 mm, and the fixed central divider 36 mm. Doors and front drawers made from particleboard, either veneered and stained or melamine-coated and lacquered, with MDF or solid wood insert, bored to provide the handle-hole. Transparent tempered glass shelves, sandblasted with polished edge, 5 mm thick. 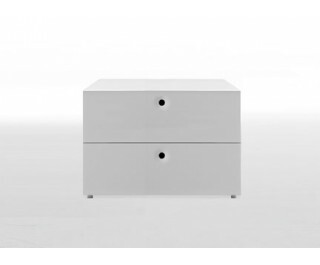 Drawers with self locking slide runners and sides made from anodized aluminium (refer to page 129). PVC or felt bumpers. Painted ABS adjustable feet with aluminium finish.